In the majority of gate and garage door motors, backup batteries are used to power the motor. These batteries are not just used in the event of a power failure but are always in use and therefore the motor will stop working when the battery is disconnected. As an automated motor user you are most likely to notice that the motor will start moving slower in the early stages of the battery going flat. At this stage you should consider a new backup battery for either your gate motor or garage door motor. Another sign of a flat motor battery is when your gate or garage door will stop halfway through the opening or closing process. If you would like to confirm that the battery is truly flat a simple test will help to confirm. Test the battery voltage whilst the battery is under load i.e. the gate or garage door, this will give you are more accurate diagnoses. If the voltage of your battery drops below 11V DC, you will then have to replace the battery. Below is a list of backup batteries to be used on certain motors. This 12V 7AH battery is standard your everyday automated gate motors. These two variations are used for your Centurion RDO roll up door motors. The 12V 2.3AH battery is used to power your Gemini garage door motors. This battery is used to power your E.T DC Blue and Eazylift motors. It is possible to replace your motors’ backup battery yourself with an extra set of hands of course. 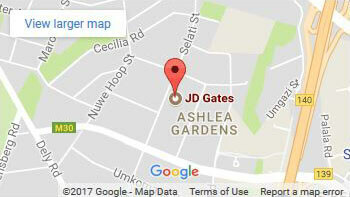 If you are however having some trouble doing this yourself, we at JD Gates are more than happy to assist you.